Designing gas cabinets to hold cylinders is an effective way of employing a centralized gas delivery system for workers and ensuring an easier way to change out spent cylinders without hampering production. When considering adding, repairing or improving a gas cabinet, manufacturers need to keep in mind the special characteristics of each type of gas that can impact the materials and operation of the gas cabinet. Some gases, such as cryptogenic gases, are extremely cold and can cause components to become brittle. 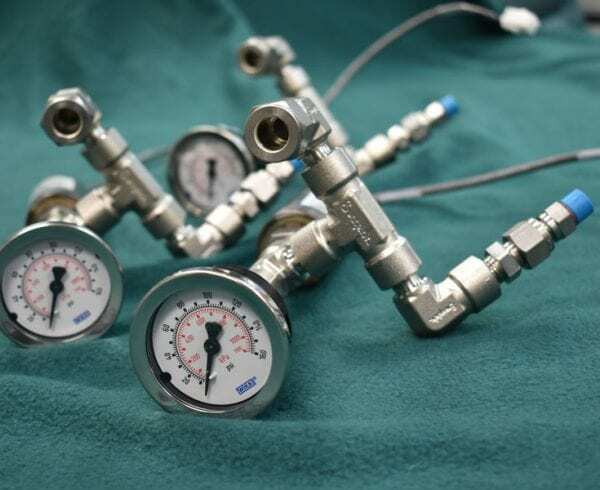 Other gases can become flammable when exposed to changing temperatures and pressure, causing a fire in the piping system, which can backflow into the gas cabinet. Following are the characteristics of certain gases that a manufacturer may choose to use in a gas cabinet, as well as the types of gas delivery components that work best for these gases to ensure a safe operation. Corrosive gases have the ability to deteriorate or destroy other materials on contact or when there is water present. These gases can also irritate and damage the skin, eyes, lungs or mucous membranes. If an OEM has a working environment where any inorganic materials or water may be able to penetrate the gas cabinet, then the gas delivery system should be equipped with traps and check valves to prevent water and other materials from getting sucked back into any cylinders containing corrosive gas. In addition, the manufacturer should have a safety policy in place that mandates workers to wear protective clothing and equipment when changing out the cylinders, as well as situate an eye and body wash station nearby. These types of gases can come with a range of different characteristics. They can be non flammable, flammable, oxidizing, reactive and high pressure. Their toxic nature will be based on the specific gas. During the design of a gas cabinet utilizing one of these gases, one issue that needs to be addressed is potential leaking of toxic gas during change out of the cylinders. Any time there is the toxic gas lurking in the inline, it could potentially leak into the room when a worker opens the cylinder valve. Purge valve systems should be designed into the gas cabinet to remove toxic gas from the piping manifold. You can purge the lines using an inert gas. Oxidant gases have the ability to combust, but won’t burn as a typical flammable gas. This type of gas can, except for O2 gas, displace the oxygen that is present in the room. Thus, manufacturers should keep all combustible materials away from the cylinders. A gas delivery system can be built fully enclosed with a small access panel where a person can reach inside to control the valves. Oxidant gases should be used with a regulator that is specifically designed and has a label that says it was cleaned for O2 gas service. Cryogenic gases have temperatures that can reach a boiling point of -130 degrees Fahrenheit. This extreme coldness can significantly deteriorate many materials, making them brittle and increasing the possibility that they crack under high pressures. Blocks in the inline can also cause temperature fluctuation, and an increase of temperature can make the line burst from pressure buildup. A safety relief valve as well as a vent line should be considered when designing a gas cabinet for these gases. Pyrophoric gases are commonly used in the semiconductor industry. These gases can spontaneously explode or catch fire without the presence of any materials to ignite them. Some pyrophoric gases can also release an abundance of heat energy. A manufacturer must take as many precautions with pyrophoric gases as they would with flammable gases when designing a gas cabinet for these gases. This includes a purge valve, vents, and a flash arrestor for the delivery system. Axenics takes every precaution to ensure that a gas cabinet is built to specifications precise to the manufacturing operation, while making sure to use materials and components that are suitable to the characteristics of each gas. Contact our in-house engineers to discuss gas cabinet options and to decide on the type of gas that would be appropriate for your project or application.